The new online ordering demo site is officially open for your viewing pleasure. This is the standard mobile (cheese theme) that ships with the online ordering package. More templates will eventually become available in time, as well as new features. This new platform is using Apache for Windows v2.2 and running CGI based modules to communicate with the POS Pizza database server. Menus are all in real-time and come directly from the POS Pizza 6 database. In other words, if you were to add an item (to an online category), or change a price, that change would take effect immediately on the web site! The orders also come into your system in real-time. When the customer processes their cart, your kitchen printers and screens will have the order just as it was keyed in at your front counter system. 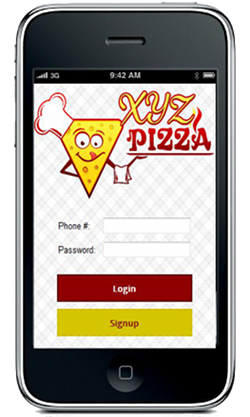 For an overview of the features visit: www.xyzpizza.com. To try the system out click on the picture below. This is now available for downloading for POS Pizza 6 [CS] users!